Bob Richling carries Iris Darden as water from the Little River starts to seep into her home in Spring Lake, N.C. on Monday. A church is surrounded by floodwaters from Hurricane Florence on Monday, in Conway, S.C.
Left: Jimmy Shackleford, 74, of Burgaw transports his son Jim, his wife Lisa, and their pets Izzy, Bella and Nala in the bucket of his tractor as the Northeast Cape Fear River breaks its banks in Burgaw, N.C. on Monday. Right: A mobile home sits off its foundation, knocked loose by floodwaters from Hurricane Florence near the Nuese River in Kinston, N.C. on Monday. 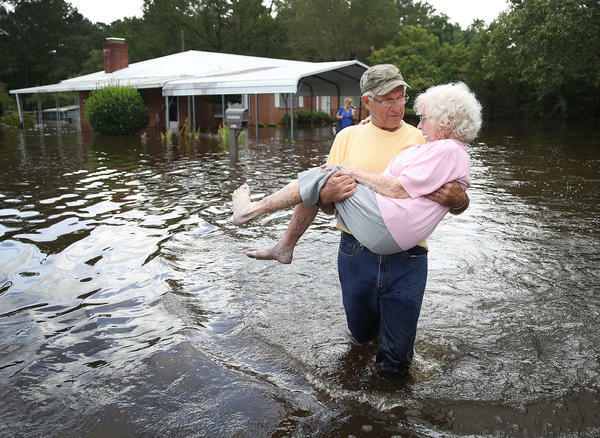 George Skinner, 83, is comforted by his neighbor Mary Ann Dunn after their homes were damaged by floodwaters from the Nuese River in Kinston, N.C., on Monday. 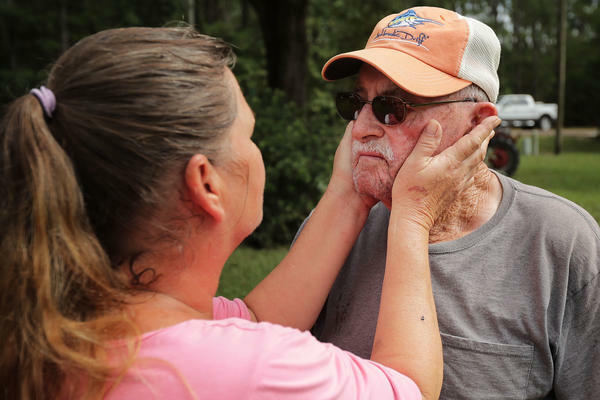 Since the creek behind his home first overflowed during Hurricane Floyd in 1999, Skinner said each subsequent storm has produced worse flooding. After Hurricane Florence, his whole family is leaving and does not plan on returning. 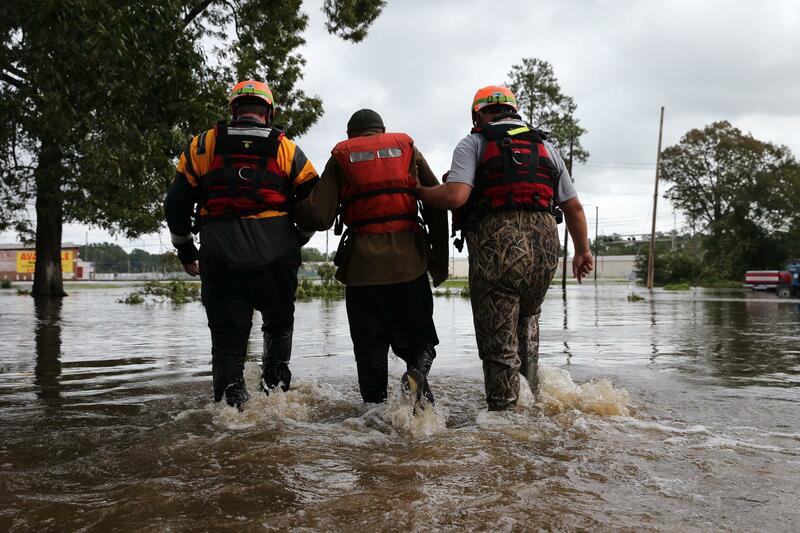 Lumberton Fire and Rescue members help a resident walk through flooded waters in Lumberton, N.C., on Monday. As former hurricane Florence marches on to New England, the Carolinas remain inundated with waters that just keep rising. "I know for many people this feels like a nightmare that just won't end. I know many people are tired of the present and are scared of the future," North Carolina Gov. Roy Cooper said Tuesday, The Associated Press reports. "But please know we will not give up on you." Florence is now a post-tropical cyclone, which the National Weather Service is describing as an "increasingly elongated low pressure area," which continues to dump heavy rain over the Mid-Atlantic and southern New England, where flash flood warnings are in effect in some places. 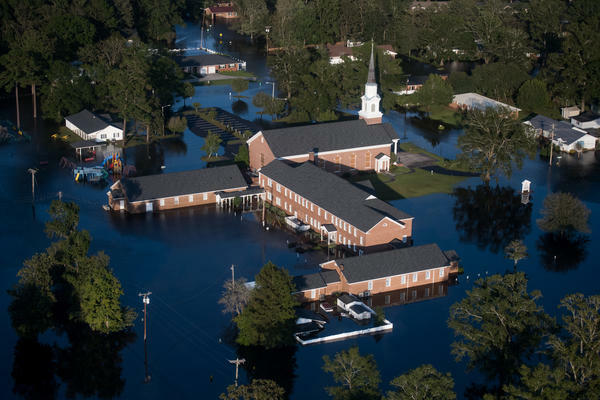 Twenty-seven of the 37 deaths attributed to the storm have been in North Carolina, where Florence and its floodwaters have caused significant damage in the state. First responders have made more than 4,000 rescues, approximately 10,000 people are in shelters, and the state has set up four mass-feeding kitchens. In a news conference Tuesday, Cooper warned that sunshine doesn't mean the threat is over, and rivers continue to rise. The state has 16 rivers at major flood stage; three still have not yet peaked. North Carolina state troopers say they've responded to 126 collisions in a 24-hour period. Road closures are widespread: more than 1,100 roads are shut down, including 255 primary roadways. Interstates 95 and 40 are closed in 19 different locations. In the state's Pender County, drone footage showed a section of I-4 that looked more like a river. In eastern North Carolina, the Little River continues to rise, but the Cape Fear River crested at about 1:30 a.m. Wednesday at 61.51 feet. By 8:30 a.m. on Tuesday, it was at 59 feet, higher than it reached during 2016's Hurricane Matthew. People are being urged to not go around or move barriers in the roadways. "Even though the heavy rains have ended, the flood hazard to life and property is real. Do not become complacent," the city of Fayetteville and Cumberland County said in a statement. In Wilmington, the mayor said two routes into the city were now open, but people who have evacuated are asked to stay away for now, the AP reports. Reporting from near Fayetteville, N.C., NPR's Sarah McCammon told Morning Edition that the Cape Fear River had risen significantly in the previous 24 hours. "That rain has to go somewhere, it flows from the basin upstream down into the Cape Fear river," Amy Cannon, County Manager for Cumberland County, told McCammon. "So it's not just our rainfall that we need to be concerned with, it's all the other tributaries in our own basin and the rain that's collected at a higher level." In Conway, S.C., some residents are concerned that a new wall meant to keep the highway to Myrtle Beach from flooding will instead push waters into their town. "It's never been done before. They can't say for certain what it might do," Conway resident Joe Holmes told the AP on Monday. "Why is that highway so important? Why can't they just fly food and fuel in? We've got a big airport." Conway's city administrator told the AP that the South Carolina Department of Transportation told city officials that the damming effect of the barrier would be negligible, and that if the river crests as high as is expected, nearly 1,000 homes will be flooded either way. The floodwaters are also causing environmental concerns in the region. One major worry is the North Carolina's many hog lagoons, full of waste from pig farms. As NPR reported before the storm, the waste is usually kept in large open ponds. The North Carolina Department of Environmental Quality says that walls on four of these lagoons had failed, spilling manure. Nine other lagoons have been inundated, and 13 more have overtopped their banks. "North Carolina allows all this dangerous waste to be stored next to its flooding coastal — and, for that matter, inland — rivers," Frank Holleman, a senior attorney at the Southern Environmental Law Center, told the Raleigh News & Observer. "How long do we have to go through this until we decide it's too much risk?" He noted that landfills, hazardous waste dumps, factories, and coal ash ponds are all located near the Cape Fear and Neuse Rivers in the eastern part of the state. The Cape Fear Public Utility Authority said on Friday that flooding had caused more than 5 million gallons of partially treated wastewater to spill from its sewage plant and into the Cape Fear River, according to the News & Observer. Two smaller sewage spills were reported in Johnston County. At least one of Duke Energy's coal ash landfills was damaged by Florence, causing at least 2,000 cubic yards of coal ash to flow out of its site near Wilmington. Sanderson Farms, a major poultry producer in North Carolina, said more 1.7 million chickens were killed by floodwaters, out of a total population of 20 million.